2015: The year that the strategists nailed? After the market’s dramatic plunge in August, strategists’ year-end targets were looking like long shots. But as the S&P closed out its best month in four years, it seems like stocks could be rising to the occasion. In October, the Dow Jones industrial average and S&P 500 rose more than 8 percent in five straight weeks of gains. The Nasdaq composite ended October up more than 9 percent. And stocks have continued their rally into November, with major indices opening up more than 0.5 percent on Monday. For the past six years, stocks have surpassed strategist estimates. But for 2015, many have called for the S&P to end at or above 2,200, which is 5 percent higher than where the index opened on Monday. 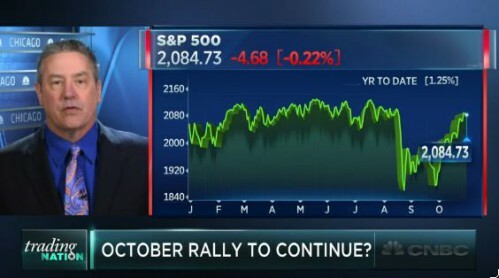 Technician John Kosar of Asbury Research said he sees stocks returning to their highs of the year in the next couple months, based on the recent run-up of total net assets in the SPDR S&P 500 ETF (SPY). Click the title at the top of the page to view the entire column at CNBC.com.